Few magazines have built more goodwill and positive vibes than Modern Farmer had in fewer than two years of publication. But it's over for the darling of the print world. Sad, 'cause I read it all the time. 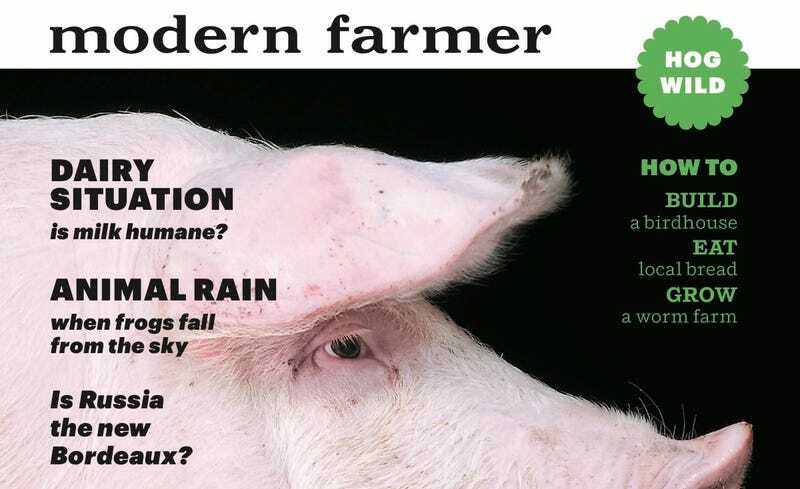 Modern Farmer has stopped publication and let go of its entire editorial team, according to a report from the New York Times. The brand had a surprise national hit with a live animal camera that allowed viewers to watch the antics of Nigerian dwarf goats on a farm in Minnesota. "There is this sense of ridiculousness around it because it is so heavily stylized, but in another way it was trying to be a mouthpiece for this generation of farmers that wants to reconcile these two worlds." Pour a little liquor out for Modern Farmer. UPDATE: Hold that liquor... The New York Times has changed its headline from "Modern Farmer Ceases Publication" to "Modern Farmer's Future In Doubt." According to them, there will be a summer issue.